Voice technology and Artificial Intelligence were all the buzz at IFA, Germany’s largest consumer electronics show in September. Established players launched new products in Europe and there were a few surprise offerings from new market entrants. Google introduced its premium smart speaker -the Google Home Max- here in Germany, along with a bilingual voice assistant feature that responds to queries in English and German interchangeably. And telecom giant Deutsche Telekom introduced plans for its own smart speaker activated with the magic words “Hallo Magenta." 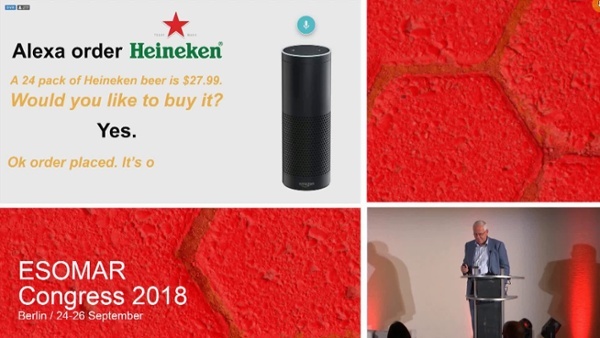 This introduction is the first smart speaker coming from a German company and includes Amazon’s voice assistant “Alexa” too. As I was setting up our new office in the heart of Berlin, I reflected on how much technology has disrupted consumer behavior from the time I grew up here. Is Voice all hype in Germany? How and will German consumers embrace these AI technologies? What are the implications for brands? My team and I recently set out to answer these questions in Germany, and also in the US and UK. We explored Voice technology usage and awareness from the consumer and brand perspective. Here I’m sharing the Germany insights, which we unveiled at ESOMAR Congress 2018 in Berlin. Despite voice-enabled devices being introduced later in Germany than in the UK and the US, the German market has caught up quickly. The majority (88%) of Germans are familiar with voice technology as it exists in smartphones, smart speakers, and other devices. 1 in 2 German consumers have ever used voice technology. Most have used voice technology on their smartphone (49% of German voice users), whereas only 22% of voice users did so on a smart speaker. Google dominates as the primary voice platform for smartphones (68%), while Amazon’s Echo is leading for smart speakers (65%). As in the US and Europe, many German users are still testing and trying out voice technology. When we see how young people and young families are embracing the technology, there’s no doubt it will become mainstream. We already see contextual habits forming: home usage of smart speakers differs from usage of digital assistants in the car, for example. Among German users, the most popular queries for voice are searching for information, the weather, getting directions and researching a product. Even though using voice technology to make a purchase isn’t one of the main reasons to use it (yet), German consumers’ openness to this is notable. 53% of German voice technology users have purchased a product via a voice assistant on their smartphone, 61% on their smart speakers. These trials surpass both the US and UK at the proportional rates with which they are using voice for purchasing. See the full infographic with highlights of SKIM Research "Voice Awareness & Usage in USA and Europe"
What motivates Germans to try this new sales channel? Besides curiosity, Germans were motivated because they thought voice would be easier and faster. Like German’s eCommerce behavior in general, the products German consumers do prefer to purchase via voice include recreational products, like books and electronics. For more functional items, such as food, pet and baby products, and personal care items, Germans still strongly prefer their local, ‘offline’ stores. It’s important to note that German consumers who’ve previously purchased using voice intend to use it more in the future. While barriers to adoption remain, such as fear of inaccurate orders or privacy concerns, it’s still important to keep in mind German consumers are largely curious about using voice technology for shopping. Collaborate with retailers to stay at the top of the queries list. If the assistant doesn’t offer your brand first or second, you will be obsolete. Consider a Direct-to-Consumer business. While this poses its own set of challenges, selling and interacting directly with consumers stand to be a more rewarding approach for brands navigating this 4th sales channel. Curious to learn more about our findings in Germany? We just opened a new office in Berlin, so drop us a line or stop by! We’d love to explore the challenges and opportunities this new sales channel offers for marketers and how new market research innovations can help drive success here in Germany.